Another Friday and a new challenge at QKR Stampede, where our main theme is always Anything Goes. But we also offer a twist which is optional and you can use it or not. This week the option is to do "Christmas Tags." I chose the "Decorated Tree" image from QKR and cut my tag to fit the shape of the tree. 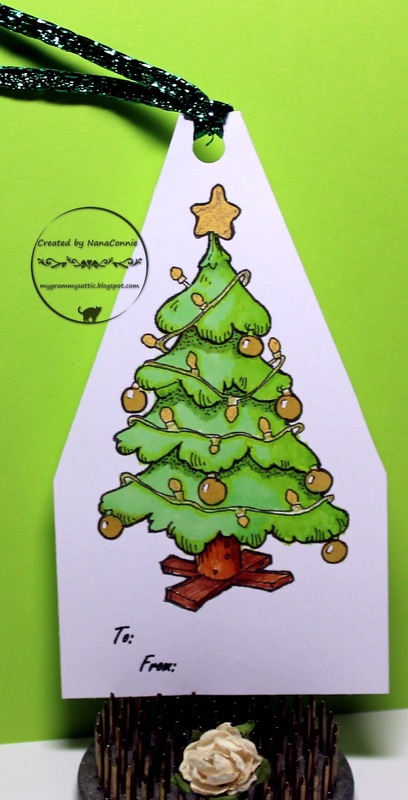 I colored the tree with ProMarkers and added glitter to the star. I used Wink of Stella on the ornaments for a bit of shine. I punched a hole in the top and added sparkly metal ribbon. This is gorgeous, love the tree. I love your Christmas tree! So cute and just the right size for this pretty little tag! Thank you to join us at House of Cards! Wishing you good luck and a very pleasant Advent. Danke für deine Teilnahme bei der KE-C.
Oooh I love this tag, that QKR tree is superb. Wonderful colouring too. Beautiful Christmas tree tag - love the shape.